Hey there, I’m Emily. Welcome to My Adaptable Career. If you’re anything like me and my readers, you want to get more done on your blog. You’ve got a to do list a mile long, and you never have enough time to do everything. I’m obsessed with time management and productivity because I feel like I never have enough time to grow my blog, either. I’m always on the look out for new tools, strategies, and short cuts to help me get more done in less time. I would love to have you join my email list, where I share all these blogging productivity tools, strategies, and short cuts. Actually, a lot of my content is exclusively for my subscribers (which means I don’t just email you a link to a recent blog post). I want to share my best tips with readers who are just as excited about productivity as I am. To say thanks (and to help you get more done), I’ll send along one of my most popular resources: my swipe file of simple social media routines. 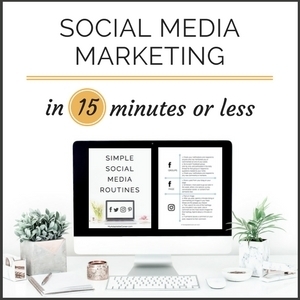 These are the 15-minute routines I follow when I want to promote a new blog post on Twitter, Facebook, Pinterest, or Instagram. Just sign up below to grab your copy!